What it looks like when you initiate a Group FaceTime call using this bug. With this screen up, you can hear the audio of the person on the other end. 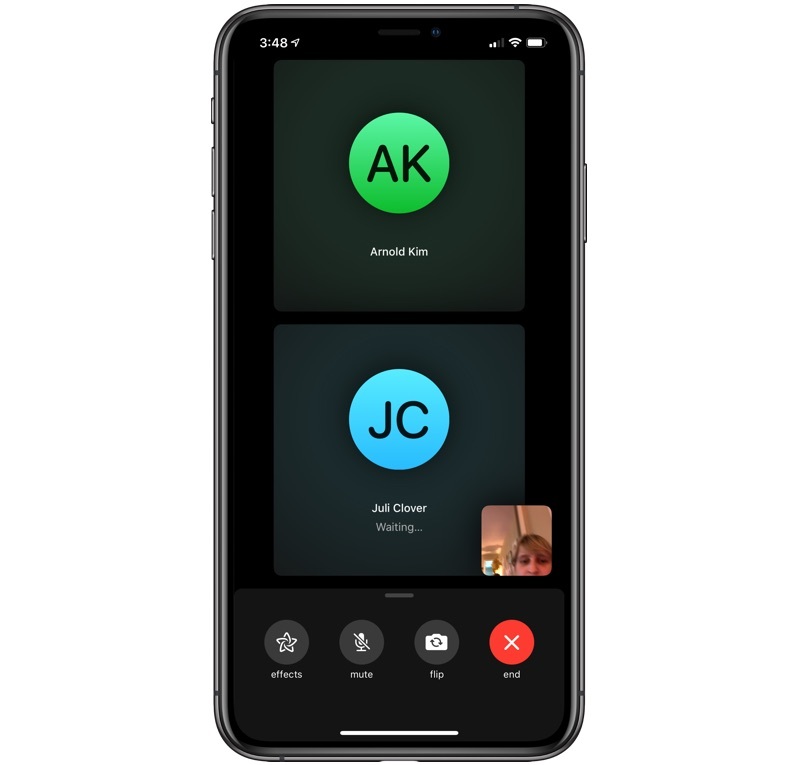 When you force a connection this way, your screen looks like a standard Group FaceTime call sans video, but on the other person's screen, it still looks like the call hasn't been accepted. This is what it looks like for the person you're FaceTiming. They can't tell their audio is accessible. For this reason, the other person can't necessarily tell that you're listening in to their audio, which has huge privacy implications, especially because the ringing stops as soon as the bug is initiated. We were able to get this to work on various iOS devices running iOS 12.1.3 and iOS 12.2, and on a Mac running the latest version of macOS Mojave. 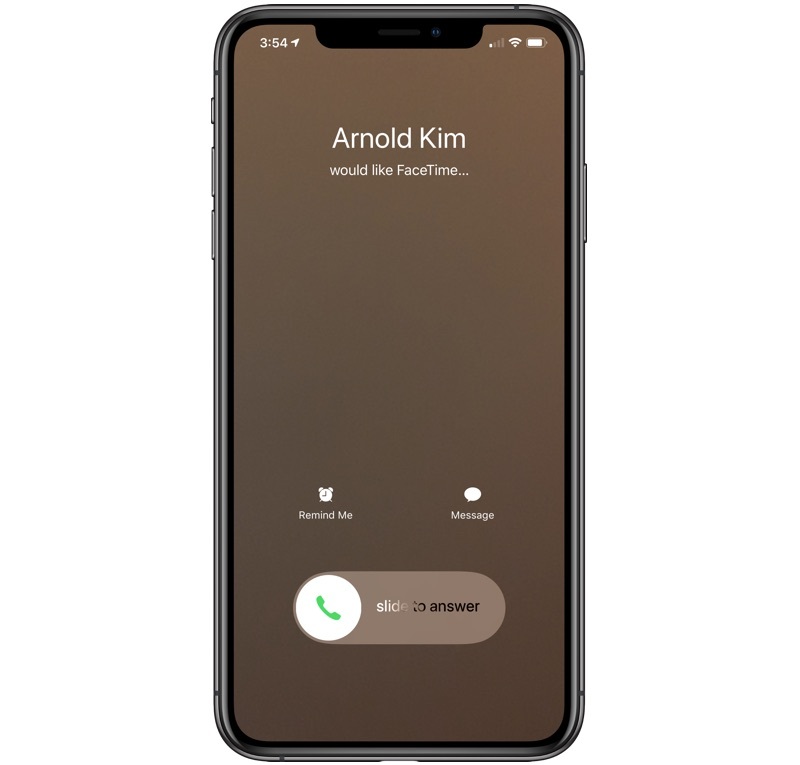 There appears to be no way to avoid this bug short of disabling FaceTime on iOS and macOS entirely, so it's likely Apple will implement a fix quickly. This bug is an audio only bug, so the person FaceTiming you does not get access to your video feed. Update: As The Verge points out, you can also covertly see someone's video. If you follow the steps above and the person on the other end presses the power button on their device to make the call go away, it activates their video. Once their video is activated, all sound is muted, so there is no indication on their end that their video is visible to a third-party person who has FaceTimed them. The video above demonstrates the issue and how easy it is to execute with just a few taps in the FaceTime app. Update 2: Apple appears to have temporarily addressed the issue by disabling Group FaceTime calls server side. On Apple's System Status page, Group FaceTime is now listed as unavailable. Ooops NSA technical surveillance feature set accidentally exposed. Bugfix will fix it soon. Gotta love Apple's integrated approach. Seriously, enough is enough. Fire Tim Cook, fire Jony Ive, fire Craig Federighi. Bring back Scott Forstall. This is what happens when you have a fashion designer run a COMPUTER company. You may not understand that despite loads of QC, beta testings, etc, software bugs still manage to slip through under the right set of conditions and circumstances. Especially with respect to complex software. I've yet to see 100% perfection. From anyone. You may totally miss the point. Accessing a user’s phone’s mic without them interacting/allowing it is so against all iOS conventions and far beyond a simple bug. Nothing should ever happen on my side of that call if I don’t move that darn slider. * It's not that bad, you don't even lose data. * I don't even use FaceTime so it's not a big deal. * It's going to get patched, not a big deal. * All software has problems. * I have nothing to hide, who cares. Hilarious bug. What’s with all this beta testing and public beta testing and this stuff goes through? Yeah yeah...QC. Wow, that is a very, very bad bug. I just tested it. To make matters worse, the original FaceTime call stops ringing when you add yourself a second time. If you’re fast enough, the first person wouldn’t even notice. Looks like Apple pushed Chinas iOS update to the states. Woops! This is obviously a feature.